Brought together by an affinity for the music of the Grateful Dead, the musicians of the Sycamore Slough String Band gathered in an Oakland recording studio early this year to discover where the music would take them, and where they would take the music. One result is their new album, First Rehearsals, "a superb collection of mostly Dead covers," in the words of the Grateful Dead Archive blog. The album "showcases the magic that can happen when fine musicians well-versed in the Dead's unique approach to small group improvisation get together to play their favorite tunes from the Grateful Dead songbook. The band’s bluegrass/newgrass arrangements tease out new layers of meaning to chestnuts long familiar to Deadheads, making this one of the most exciting revisits of Dead music in many years." Another result of those sessions in the studio is this show, which promises to be hugely entertaining for fans of rich, complex music played with know-how and joy. 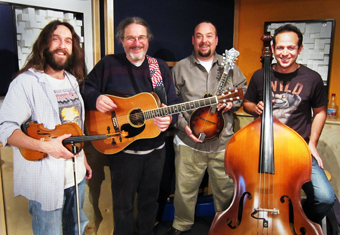 With David Thom on mandolin, guitar, and vocals, Fiddle Dave Muhlethaler on fiddle, mandolin, and vocals, Roger Sideman on bass and vocals, and David Gans on guitar and vocals, the band boasts four sterling musicians, each with a gift for exploring, jamming, and sharing a collective vision. David Thom worked for two years as a guitarist with the David Grisman Bluegrass Experience, has led the David Thom Band since 1996, and also plays in Grandpa Banana’s Band. Fiddle Dave was a co-founder of Cornmeal, has toured with the Artimus Pyle Band, and recently spent a year playing in The Fall Risk, a band led by Furthur’s Jeff Pehrson. Bassist Roger Sideman has performed with Michael Kang of String Cheese Incident and bluegrass legend Frank Wakefield, and currently performs with The China Cats. David Gans performs solo on electric guitar and also plays with Chris and Lorin Rowan in the Beatles jam band Rubber Souldiers, as well as pursuing a host of Grateful Dead-related activities on the radio, online, and in books. These folks don’t just have an affinity for the music of the Dead — everyone in the Sycamore Slough String Band loves the music, and the love comes through when they play. The multi-talented, multi-instrumentalist Danny Carnahan of Wake the Dead joins tonight show.